ABBAS MAMDANI! 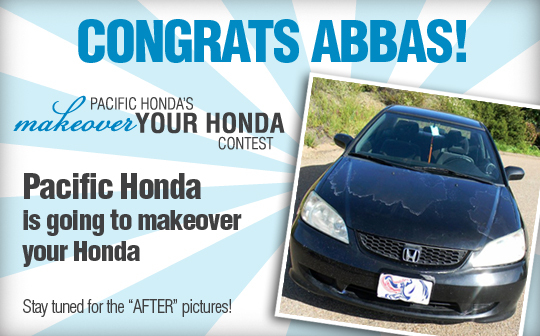 Everyone at Pacific Honda sends a BIG CONGRATS our winner of the Makeover Your Honda Contest. This was a 6 week contest as our way saying thank you to the community by awarding one lucky winner a makeover to their Honda. Entries were submitted which included a story about why they deserved to win. Abbas won with 151 votes. Nice work! Also, a BIG THANK YOU to all who participated in this contest. We can't wait to do this again for another member of the community. Stay tuned for the "after" pictures and Abbas' reaction!